Eight Days to Amish: (To every truck) Turnip! Turnip! Turnip! I vowed two weeks ago that the very next time I heard or read someone claim they “didn’t just fall off the turnip truck” I was going to investigate. Boom, there it was in yesterday’s letters to the editor. And by investigate, I didn’t mean I was going to check their knees for scrapes or turnip truck tire tread tracks. Just what the hell is a turnip? I swear, I’ve spent my entire life, nearly 50 years, and have never tasted a single turnip. I’m unashamed of the admission. I’m friends with many who’ve never tasted a single vegetable. Yet, judging by much of the political commentary, our nation’s highways are coursing with interstate trucks that are forever ejecting stick-whittling idiots incapable of sensible thought. So let’s get to the root of this turnip business. And with turnips, the root is a great place to start. Turns out the turnip is all root. It’s been a cultivated root vegetable since prehistoric times and became popular during the Middle Ages because its heartiness made it a staple for poor folks. It enjoyed a heyday in the 1730s when a British politician named Charles “Turnip” Townshend began importing Dutch turnips to feed cattle. It’s a chicken and egg question about whether Townshend was nicknamed “Turnip” before or after he began dealing with the Dutch, but it must be a relief to vegetable historians that he wasn’t nicknamed “Eggplant” Townshend. That common beasts of burden seemed okay with turnip did nothing to elevate its reputation. Today, turnip doesn’t even crack the top 10 vegetables which, in case you’re scheduled for some vegetable game show later today are: potatoes, iceberg lettuce, tomatoes, onions, carrots, celery, corn, broccoli, gummi bears and cucumbers. (I put gummi bears in to see if you’re paying attention; no. 9 is green cabbage). Still, I’ve never heard of anyone falling off a potato truck. Of course, there’s nothing to say turnip trucks don’t vastly outnumber the turnips they’re duty-bound to transport. Certainly, people who drive turnip trucks are more apt to tumble off them and the falls may hinder their ability to calculate profitable freight loads. A turnip truck could conceivably have just one turnip rolling around in the bed. An internet search for actual vehicles transporting the vegetables turned up nothing. For the sake of ironic observation, let’s say it was fruitless. I did find a quirky little organic market called The Turnip Truck in one of my old stomping grounds, the grungy Nashville neighborhood known as The Gulch, not far from where I got my start as a newspaper reporter. I’m going to try and stop there on my next visit if for no other reason to see if they can afford delivery trucks. 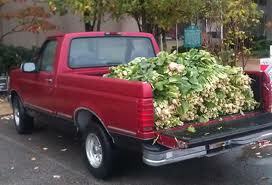 I imagine insuring Turnip Truck delivery vehicles would be exorbitant. One place you’re likely to see actual turnip trucks is Wardsboro, Vermont, pop. about 900, and home to the Gilfeather Turnip Festival, named after the father of the American turnip, John Gilfeather. He began growing turnips nearly 100 years ago, hoarding the seeds and severing the tops and bottoms so no one else could replicate the produce. Me, I’d have called him “Fish Tickler” Gilfeather and see if anyone caught on. The late October festival allows visitors to enjoy turnip soup, turnip bread and purchase things like turnip educational videos and pro-turnip t-shirts. As you can probably surmise, yesterday was one hell of a productive day. In fact, it’d be proper to conclude anyone looking into the origins of the falling-off-the-turnip-truck phrase must have been run over by one. Well, my digging was not in vain. My quest for the originator of the phrase signifying bucolic mental incompetence led me to Hollywood and Johnny Carson. Sources say it was Carson who popularized the phrase. I admit to being disappointed. I was hoping the story would have had a much more colorful history involving bouncing vegetable trucks and bloody bumpkins. It is not to be and once again we must bow to the power of pop culture. So there. I hope that’s all you’ll ever need to know about turnips, a vegetable you can really root for. Because it’s really rooting for you. I've actually alway been quite confused by the thought of anyone falling off of a turnip truck, actually, anyone falling off of any truck. Why aren't they wearing their seatbelts; isn't it the LAW? Who are these people? Good point about the seat belts, Emma. And my mind is open to turnips. I have to get around to giving them a try. So glad you're still reading! Have a great weekend!